Remember watching the royal wedding in your pajamas on April 29? Well, now you can get up close and personal with the bridal items worn and used by the new Catherine, Duchess of Cambridge. Every summer, Her Majesty opens Buckingham Palace for tourist season with the annual summer exhibition. The exhibitions are usually different every year. 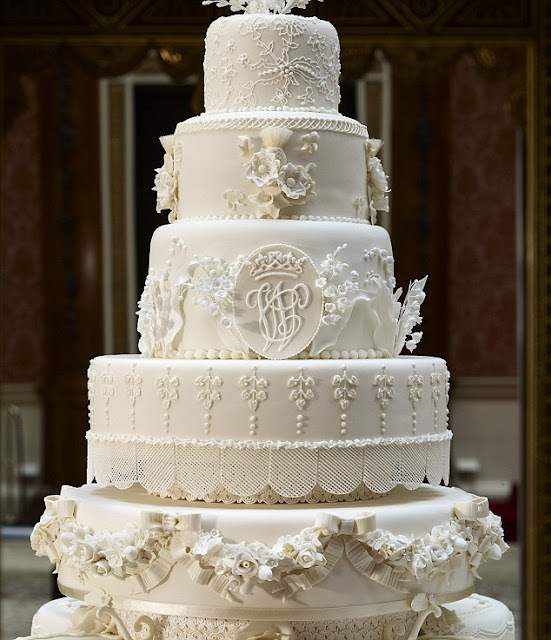 This summer, we are lucky enough to have items from the royal wedding on display. It’s like going to a museum and paying extra to see a special temporary but utterly epic exhibit, such as when I went to see the Egyptian exhibit, the Titanic exhibit, the Lincoln exhibit, etc., at various museums. My favorite exhibition was when the Louvre loaned a lot of things to the High Museum of Art here in Atlanta. I geeked out for about a year after the exhibition ended. It was that epic. The Duchess’ wedding things in an exhibition is making my head explode too. Today, the Duchess gave Her Majesty a private tour of the exhibition and then they will (or they might have already) open the exhibition to the public this afternoon. For about $30 (that’s about average for any special exhibition here), tourists can have their tour of Buckingham Palace and see the Duchess’ wedding items on display in the ballroom where her wedding reception was held. In addition to her stunning wedding dress, you will also be up close and personal with her silk veil, the diamond Halo tiara, the earrings that were a gift from her parents, the shoes, a replica of her bridal bouquet, and the royal wedding cake. The wedding dress, veil and tiara are not even in a display case, which is interesting, because they wanted the public to be able to really look at the intricate detail work. 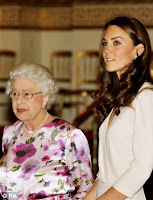 There appears to be a little bit of a tense moment, however, as the Queen came close to the dress and was heard to tell the Duchess that it was “horrible” and “horrid” that the mannequin had no head. 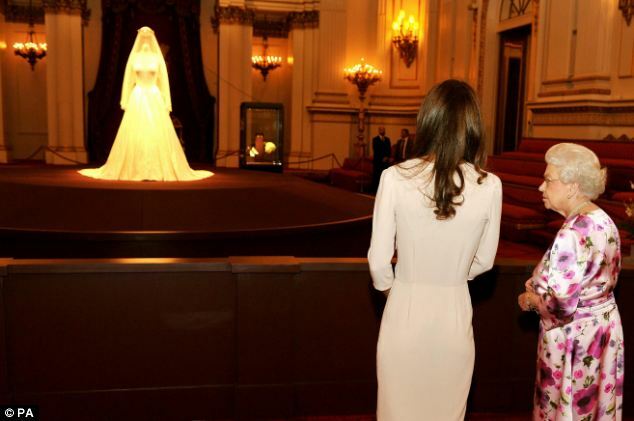 As you will see in the pictures, the wedding clothes are displayed in the center of the ballroom on a circular platform with ghostly lighting illuminating a Kate-sized mannequin with the tiara and veil suspended over a headless body. It does look a little bit ghoulish and foreboding. The Duchess, eager to diffuse the situation, responded lightly that the display gives the dress a “3-D effect”. Good thinking, Kate! Still, I side with the Queen. It looks a little ghoulish to me, as if memorializing a woman who has not died. Can’t hop on a plane and pop in on Buckingham Palace? Fear not! I have collected the best pictures of the special exhibition for you. Put on your fanny packs, tourists. Here we go! The Duchess and the Queen arrive at the exhibition. The Duchess and the Queen looking at the dress. The Queen thought the headless mannequin was “horrible”. 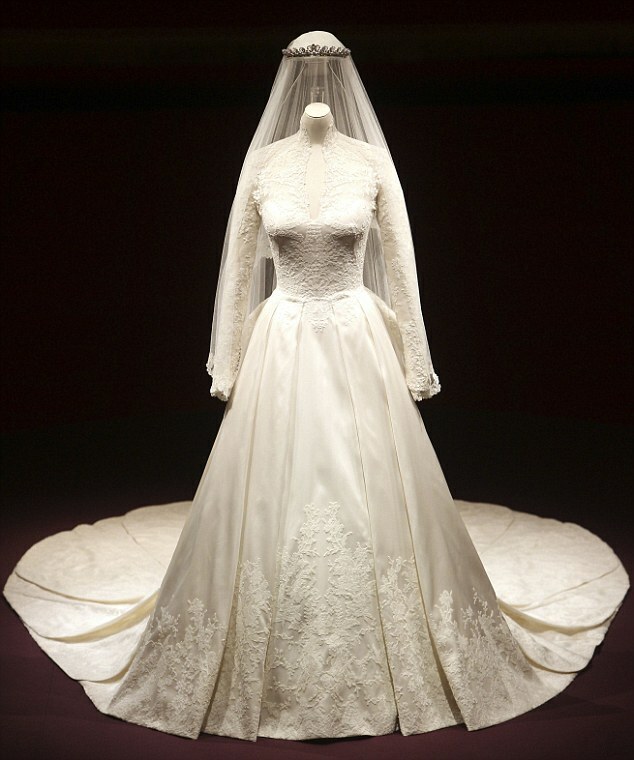 Catherine, Duchess of Cambridge wore this dress on her wedding day. 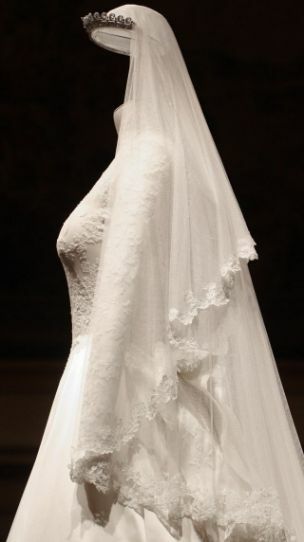 A profile view of the Duchess’ wedding dress, veil and tiara. 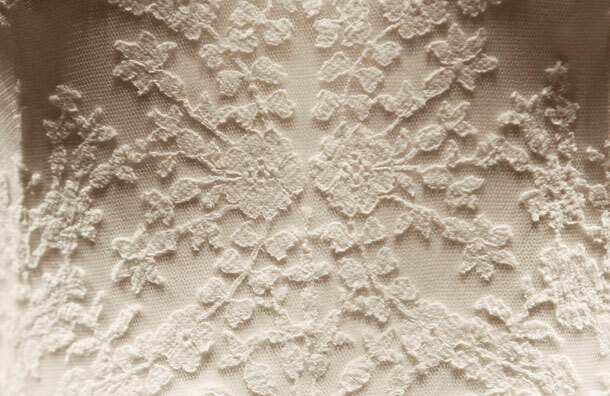 Detailed view of the gorgeous lace along the waist of the Duchess’ wedding dress. 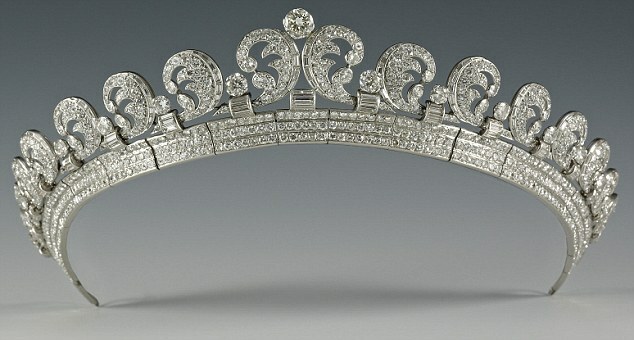 The Halo tiara lent to the Duchess by the Queen for her wedding. 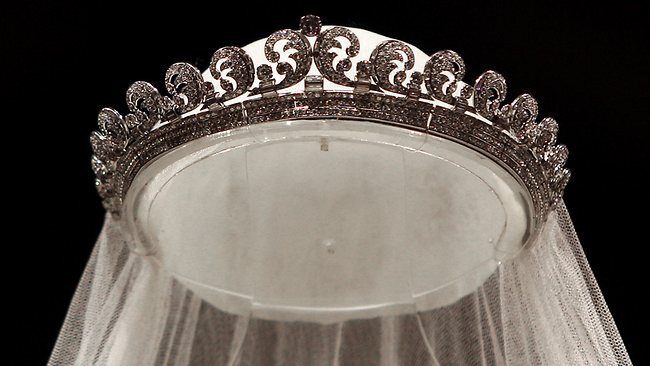 The Halo tiara displayed with the Duchess’ veil on the headless mannequin. The Duchess’ acorn and oak leaf earrings worn on her wedding day. 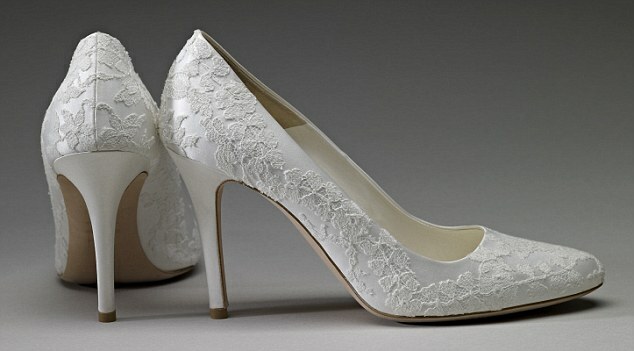 The handmade shoes the Duchess wore to her wedding. She is a size 5 1/2! 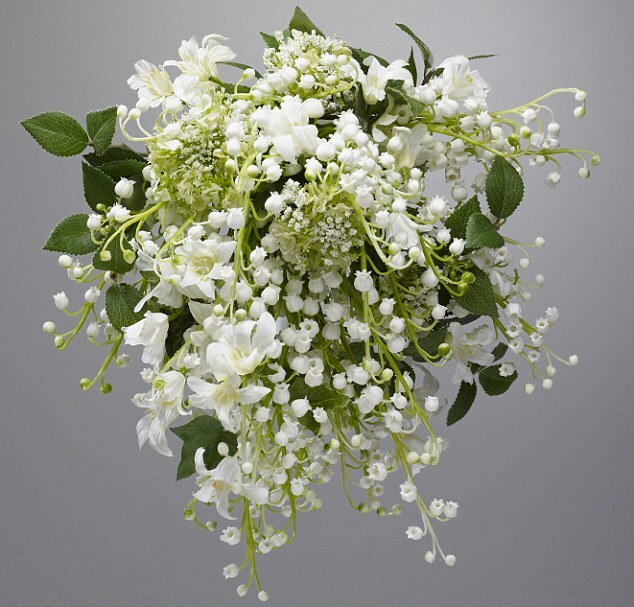 A replica of the Duchess’ wedding bouquet. 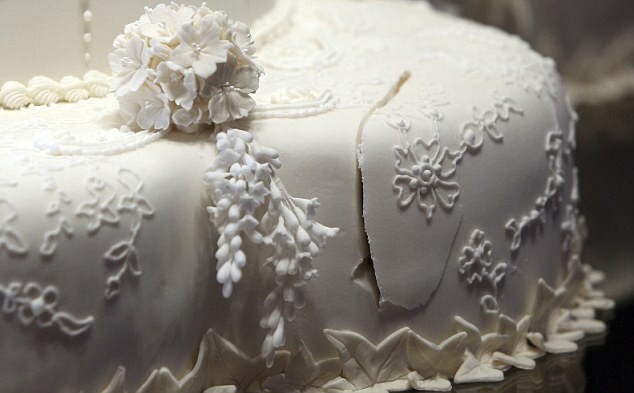 Most of the wedding cake is original! Top two tiers were saved for the christening of the first child. Here you can see where the Duke and Duchess cut the cake. Isn’t it all gorgeous? Who’s coming to London with me? !